Sat 5 Sep: Final Practice, 09:55-11:05, BBC Radio 5 live sports extra (BBC Sport website-only), & Qualifying, 12:55-14:05, BBC Radio 5 live, & Qualifying Highlights, 17:00-18:10, BBC One. Sun 6 Sep: Race, 12:30-15:00, BBC Radio 5 live, & Race Highlights, 17:05-18:35, BBC One. Live text commentary available on the BBC Sport website. Williams are retaining their driver line-up of Valtteri Bottas and Felipe Massa for the 2016 season. Bottas, 26, is in his third season with the team and had been linked with a move to Ferrari for next year before they re-signed Kimi Raikkonen. Williams considered signing McLaren's Jenson Button if Bottas had left. Brazilian Massa, 34, joined Williams in 2014 and is currently fifth in the drivers' championship, three points ahead of his team-mate. 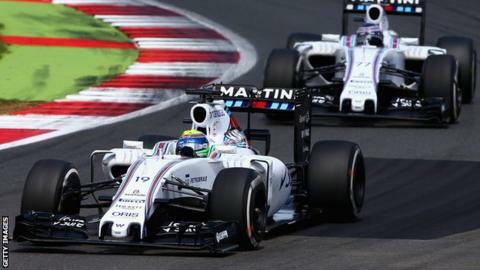 Williams are third in the constructors' championship, behind Mercedes and Ferrari. Bottas, who finished fourth in the drivers' title last year, said two weeks ago the Ferrari rumours were unsettling, adding: "For sure, it doesn't do any good to my and the [Williams] team's relationship." Team principal Sir Frank Williams said: "To be able to enter a third season with one of the strongest driver line-ups on the grid puts Williams in a fantastic position to continue its momentum towards the front of the grid in 2016." Williams, powered by Mercedes engines, have been one of the strongest teams on the grid in the past two seasons but have not won a race since the 2012 Spanish Grand Prix. Next year's line-up is taking shape, and earlier this week German driver Nico Hulkenberg signed a new two-year deal to stay at Force India. Leather helmets to halo cockpits - but how safe can F1 ever be? Read more on Leather helmets to halo cockpits - but how safe can F1 ever be?